Join us to experience Chicago based saxophonist Dave Rempis and his solo tour concept; Lattice. The plan is to work with local improvisers in every town he hits along the way – some old friends, and plenty of new collaborators. Here in Dallas he’ll be joined by Ingebrigt Håker Flaten. We’ll also count with the experimental approach of Isabelle Duthoit and Franz Hautzinger, and our beloved local Yells at Eels. Norwegian bass player Ingebrigt Haker Flaten (The Thing, The Young Mothers, Atomic and another hundreds of amazing projects) is joining Dave Rempis, extraordinaire saxophonist from Chicago (Ballister, The Rempis Percussion Quartet, The Vandermark 5 and some other hundreds of collaborations), for some dates in Texas. Isabelle Duthoit, French clarinetist and vocalist, is travelling with Franz Hautzinger, trumpet player from Austria. She has recorded with Jacques Demierre and Roger Turner, among many others. He has been developing a kind of resonant way of playing were just breathing seems more important than other musical aspects; his body of work includes recordings with Derek Bailey, Fennesz, Ekkehard Ehlers, Otomo Yoshihide, Oren Ambarchi, Ava Mendoza and Luc Ex. Yells At Eels will be kicking off a ten day tour that will take them around Texas and Louisiana. Los Gonzalez don’t need much an introduction around here, I think. They are local titans. Mutarrancho, will be selecting mucha buena música (jazzes, international jazzes and other sounds from far beyond) before, between and after them. In 1993, Rempis began a degree in classical saxophone at Northwestern University with Frederick Hemke. Finding this environment stifling, Rempis quickly ditched the music degree to pursue studies in anthropology and ethnomusicology. As part of these studies, he spent a year at the International Centre for African Music and Dance at the University of Ghana, Legon, studying African music and ethnomusicology. He also continued to perform with many different types of groups, ranging from highlife and reggae bands while in Ghana, to jazz, free jazz, funk, and contemporary music ensembles at home. He graduated from Northwestern in 1997. Upon graduating, Rempis decided to focus on performing, and in March of 1998 at the age of 22 was asked to replace veteran saxophonist Mars Williams in the well-known Chicago jazz outfit The Vandermark Five. This opportunity catapulted him to notoriety as he began to tour regularly throughout the US and Europe playing clubs, concert halls, and festivals on both continents. During his tenure with The Vandermark Five, Rempis also began to develop the many Chicago-based groups and international collaborations for which he’s currently known, including The Rempis Percussion Quartet, The Engines, Ballister, Rempis/Abrams/Ra, Wheelhouse, The Rempis/Rosaly Duo, and The Rempis/Daisy Duo. Rempis has been named regularly since 2006 in the annual Downbeat Critics’s Poll as a “rising star” on alto saxophone, and as a “rising star” and “established talent” on baritone saxophone. Ingebrigt studied Jazz at the Music Consevatory in Trondheim, Norway (1992-1995) under the tutelage of bassplayer Odd Magne Gridseth. A muscular player whose tone and attack run the gamut from Paul Chambers to Buschi Niebergall, his sense of both openness and control serves ensembles as diverse as The Thing, Free Fall, Atomic, Scorch Trio and the Kornstad/Håker Flaten Duo. In addition to his own Chicago Sextet and Austin-centric Young Mothers, Flaten has also recorded and performed with Frode Gjerstad, Dave Rempis, Bobby Bradford, the AALY Trio, Ken Vandermark, Stephen Gauci, Tony Malaby, Daniel Levin, Dennis Gonzalez and numerous others. 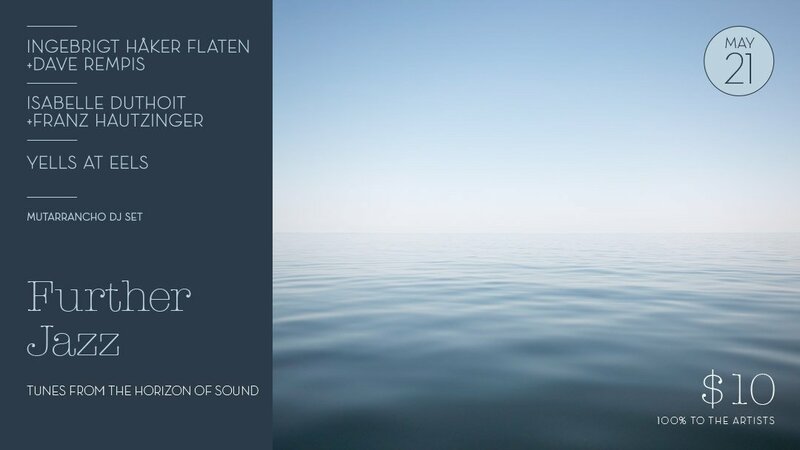 Flaten’s artistry is often in collective, leaderless ensembles and in fact, following a decade of professional musicianship it wasn’t until 2004 that his leader-debut was released – Quintet (Jazzland, followed in 2008 by The Year of the Boar, and a Sextet recording is upcoming). In 2011, he formed another ensemble, The Young Mothers, which includes drummers Stefan Gonzalez (Dallas) and Frank Rosaly (Chicago), trumpeter/poet/rapper Jawaad Taylor (New York), saxophonist Jason Jackson (Houston), and Jonathan Horne (Austin) on guitar. Born in 1970 in Montargis. Classically trained, Isabelle Duthoit moved very early to a more contemporary approach working with different ensembles and composers, being free improvisation her favorite field. With the Trio Canapé, a photo-phonographic project and music, she tries to play the (musical) sound within the sound and visual territory of everyday life. Since she has always been attracted by the voice, she has developed a technique of singular singing, a language before language. She sings and improvises solo and duet with Phil Minton. In 2008, she resided at Villa Kujoyama in Kyoto, Japan, to perform a solo voice performance in connection with the sound world of the Nô and Bunraku Theater. From 1995 to 2005, she committed improvised music by creating the festival Fruits de Mhère “the fields of improvisation” with Jacques Di Donato. Since 1997 she teaches clarinet and improvisation at the Departmental Radiation Conservatory of Evry (Essonne). He studied at the Jazz department of today’s Art University in Graz from 1981 to 1983 until lip palsy forced him to take a six year total break from trumpeting. After moving to Vienna in 1986 he started in 1989 to explore the trumpet in his very own and un-academic way. The conscious decision to avoid electronic sound sources but to still comprehend the development of digital music on the trumpet – the quarter tone trumpet purchased in 1997 – were decisive stages for the creation of Franz Hautzinger’s sensational solo trumpet CD Gomberg (2000) on which he presented this new until then unheard cosmos of sound that he had developed on his instrument. Hautzinger positioned himself with Gomberg at the front line of the international improvisation avant-garde; collaborations and CD records with Derek Bailey, the “AMM” veterans Keith Rowe and John Tilbury as well as Axel Dörner, Christian Fennesz or Otomo Yoshihide, and Sachiko M followed. Oak Cliff’s internationally-known First Family of New Jazz, and winner of the Dallas Observer’s Best Jazz Group of 2012 award, Yells At Eels marked its 17th year as a jazz trio in May of this year. The ensemble, which frequently plays live and tours with guest musicians all over the world, records mainly for the French jazz label, Ayler Records, even though their first CD’s were released on their own Oak Cliff-based record label, daagnimRecords, starting in 2000. The Gonzalez family cooperative features patriarch musician/visual artists/educator/writer/broadcaster Dennis Gonzalez on trumpets, gongs, voice, whistles, conch shell and percussion, as well as sons Aaron Gonzalez on upright bass and Stefan Gonzalez on drums. Decidedly a step away from traditional jazz, their music is lively, creative, and highly energetic and original. All three have taught in Oak Cliff’s free after-school youth music program, La Rondalla, which after six years has finally its own facility in the neighborhood. Dennis Gonzalez is the Director of the institution.